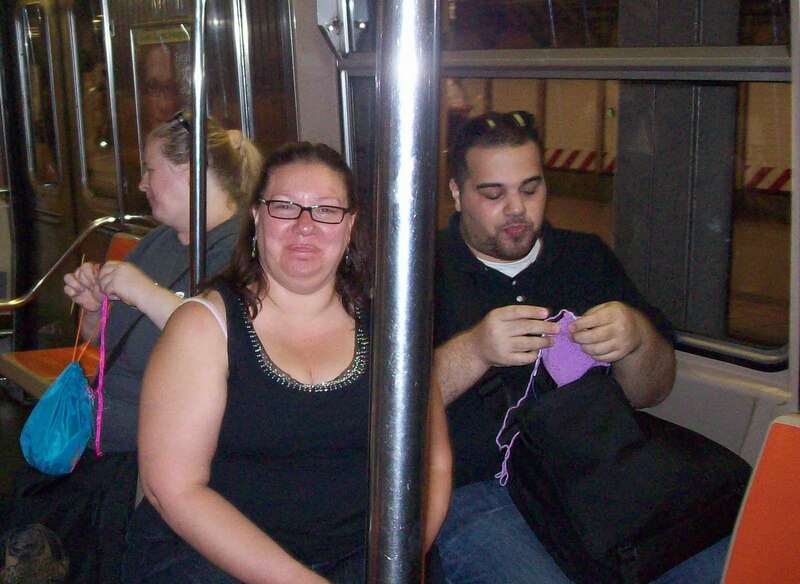 Knitting on the subway events have been held in almost every city that has a subway. Two years ago, on New Years day, I tried to organize one event. One disadvantage to subway events on the NYC subways system, is there are no loops. The NYC subway system has over 350 miles of track—and almost every line has 4 tracks (2 local, 2 express). NYers--(well real NYers!) know the system by an archaic landmarks. The subways, (the oldest lines over 100 years old) were build by 3 competing companies, the IRT (Interboro Rapid Transit), the IND (Independent Transit) and BMT (Brooklyn and Manhattan Transit). While all the tracks are standard gauge, there are major differences. The IRT has narrow (but high ceiling-ed tunnels, with gradual curves—so the cars are longer. The IND, wider tunnels, (with lower ceiling) and tighter curves and corners—and short cars. The BMT (the line I am least familiar with!) has differences, too; but I am not sure of what. What I do know is: 3 sets of rolling stock! Most riders are at least vaguely familiar with the differences, The seating on each line is different (and don't get me started on the stupidity of yet another set of rolling stock for the train to the plane(JFK airport line) ). 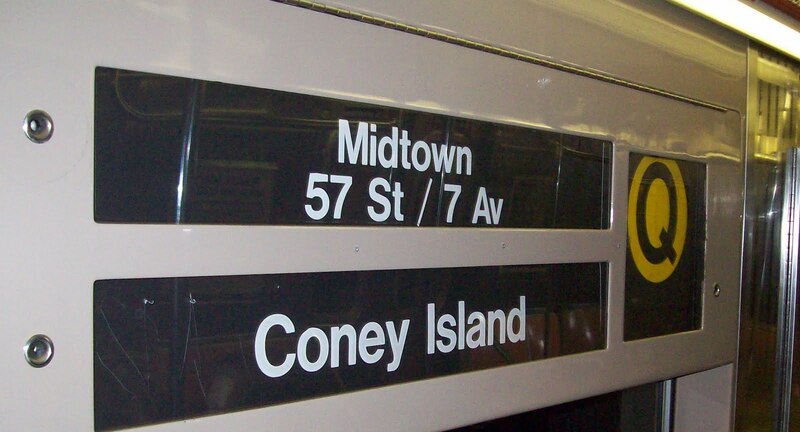 In the 1930's, the city took over all 3 lines and merged them, into what is now part of the MTA system. (The MTA is also responsible for the light (commuter rail) in NYC.) At the same time, they began to merge the stations—since originally there was no free transfer between any of the competing lines. Modern maps make no reference to the old IRT, IND or BMT--but NYers still, often refer to different subway lines by these long gone companies. Today, maps are color coded (a rainbow of colors.) The name of the trains (numbers or letters) are remnants of the old companies. The collection of photo's isn't everybody,(by the time I thought to take photos, the train was moving, and some were blurry) but most. 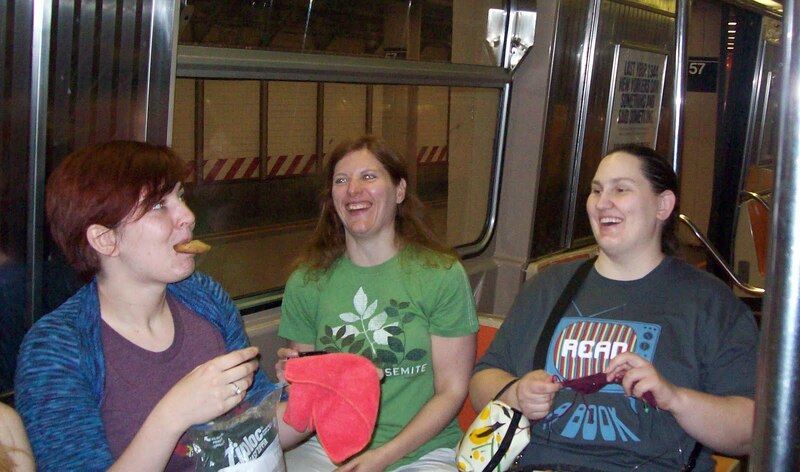 About 30 of us met Saturday afternoon, and took the Q train to Stillwell Avenue terminal in Brooklyn (aka, Coney Island) , and then had a lunch, and slowly dissolved into smaller groups and headed home. 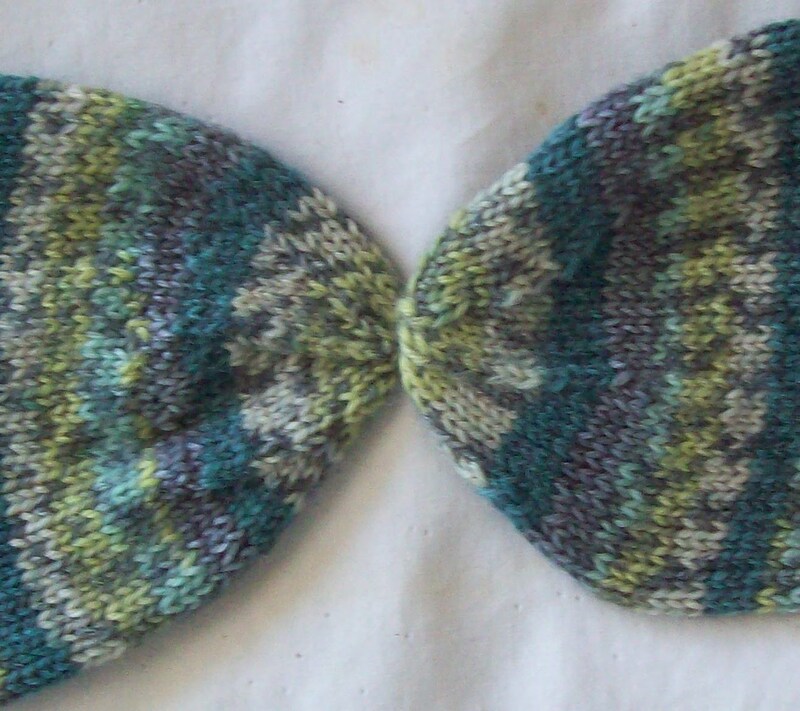 Last but not least, Friday (April 30) saw the completion of these socks, too. 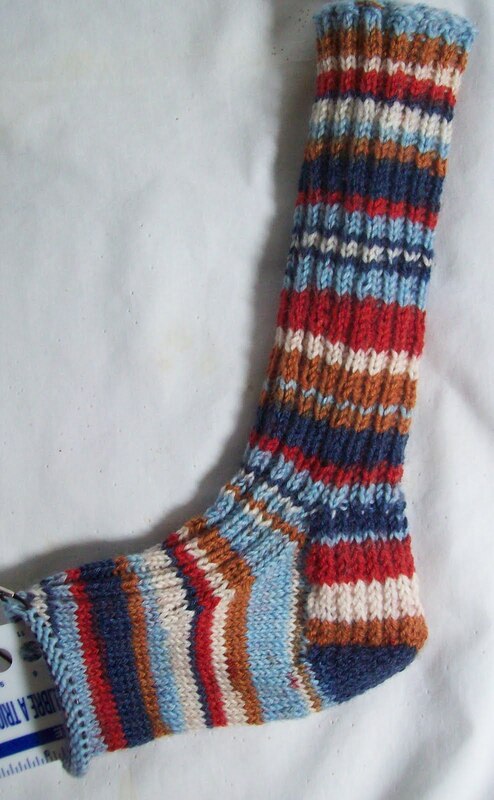 Before the grey stripe, the stripes are near match, after, a perfect one; so these socks have matching toes. The stripe finished off the last few yards of grey, too! I love most self striping and patterning yarns, and the pretty designs they make, but I am almost never willing to leave well enough alone. I'm very happy with the touches of almost solid grey, I like the personalized detail. 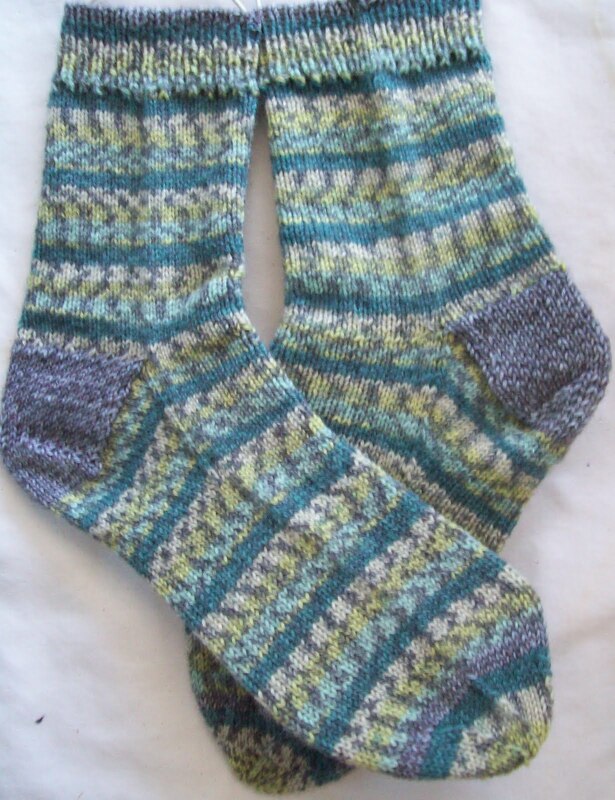 It's rainy today, but warm, and today is the first day I am not wearing wool socks this year—But I still intend to knit some more! 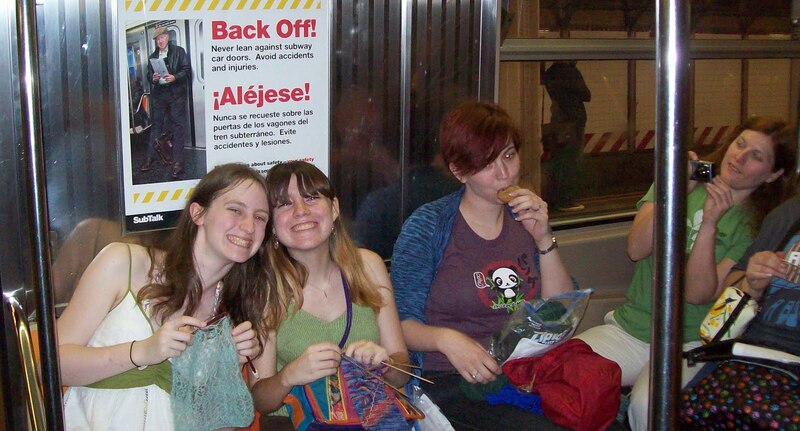 I've spent some time on the 7 Train, but it never occurred to me that there were no loops. Duh! Your grey stripe socks are nice! Sounds like a wonderful way to spend your birthday - and I had no idea that the subway comprised to three competing companies. It makes sense, there were different trolley companies here and in Los Angeles. Just like there were different phone companies etc. I guess young 'uns like me are used to a conglomerated kind of world.